Straight-shank, slotted-body blind rivet nuts provide superior pull-out resistance in plastics as well as thin sheet metals. Installation is quick and simple, and their surface finish provides outstanding corrosion resistance. 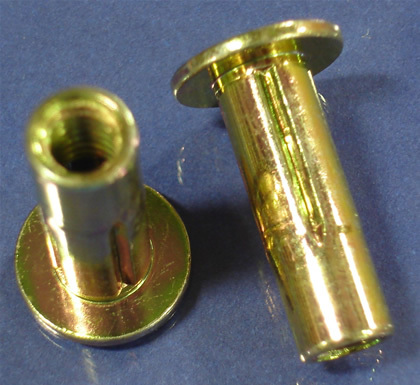 These industrial fasteners are offered by JHP Fasteners in a variety of thread sizes (inch and metric). These rivet nuts are easily installed via use of hand tools that can be pneumatic, hydraulic, or manual. There is no special tooling required. The straight-shank design uses a smaller mounting hole than that required for the pre-bulbed version. The straight-shank, slotted-body rivet nut will provide excellent performance in thin sheet metals as well as plastic materials. They can effectively reduce your assembly costs by helping to minimize your use of loose hardware and increasing your overall assembly speed. Their surface finish is also highly resistant to corrosion. JHP Fasteners offers a full suite of industrial fastener products. Our long history in the industry has allowed us to build customer bases from virtually every industrial market segment. Our 40 years of industry experience allows us to provide our customers with…..